Kantanka Automobile Company from Ghana, with the core business of automobile manufacturing and assembling of automotive components, owned by technological genius of our time, Apostle Dr. Ing. Kwadwo Safo has final manufactured classic saloon cars built to withstand the Ghanaian and the African terrain with style. 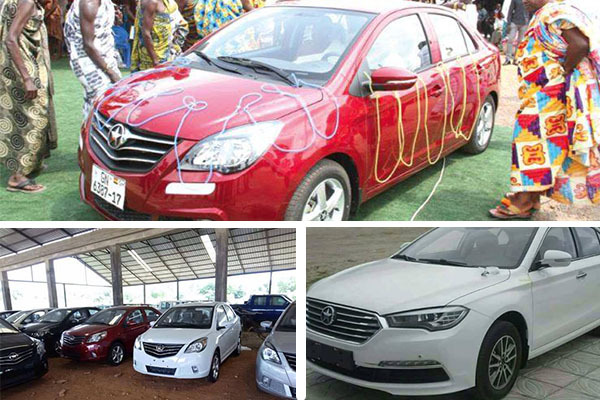 The company has four models of vehicles available for sale ranging from SUV (Onantefo), Mini SUV (K71), Pickups (Omama) and finally the new model Saloon (Amoanimaa and Mensah) have been released unto the market few weeks ago. Kindly check out the prices and pictures of the cars with its vehicle review. (salon car) is powered by a 1.5-litre four-cylinder engine that produces 102 horsepower. A five -speed Automatic Transmission Standard with a handsome dark interior styling fitted with soft-touch surfaces with better front seats and spacious at the back. The car has a low running costs of 6.4 liters per 100 km fuel consumption. It comes with a Chrome plated air-inlet grille, air condition, Tire Pressure Monitor System, with a reverse radar. The electric power steering of the car makes driving positions relaxed. The car is built with a super strength energy absorption body, a headlamp with height adjustment, door unclosed warning, Radio, CD, USB interface and has high standard of security and a cruise control system. With Kantanka Amoanimaa, you will be cruising with pride. Kantanka Mensah is also an automatic salon car which has 4866mm long body and 2775mm long wheel base. It has an inductive ease open trunk with trunk size 510 L large. The car offers a 2.4cc engine size with a four-wheel independent suspension system. Kantanka Mensah is built to withstand the extreme African weather conditions and it is equipped with full-automatic air conditioner with PM 2.5 carbon filter, a 6-way power heating sports leather seat, 4-spoke sports multi-functional leather steering wheel, an automatic headlamp illuminating angle one-key adjustment with GSI driving shift indicating system and an 8-inch HD touch screen. The car has 6-speaker acoustic system, power two-mode anti-pinch sunroof, parking assistance, and intelligent mobile interconnection system. The car again has super strength energy absorption body, a 6-way electronic SRS, ABS wheel speed acquisition system, 6-probe anti-collision radar and has high standard of security and a cruise control system. Kantanka Mensah, Binging luxury to your doorstep. PACKAGES FOR ALL CARS: Payment plan includes 50% instant payment and rest spread evenly between 6 – 10 months; 6 months after sales services with mobile vans all over the country; 3 years warranty or 100, 000 Km road cover; free DVLA registration of vehicles for customers.